At Disney's Pop Century Resort, you will take a trip down memory lane with the biggest hits of 20th-century pop culture . Disney's Pop Century Resort celebrates pop culture through the years, with ten different four-story buildings that celebrate individual decades (50s, 60s, 70s, 80s and 90s). This resort celebrates the fashions, catchphrases, toys and dances with larger-than-life icons with letters and objects from the decades they represent. 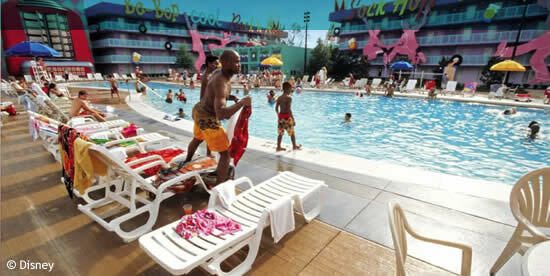 Disney's Pop Century Resort is a 2,880-room hotel featuring giant icons that salute 20th-century popular culture. The rooms reflect the styles from each era and feature mostly two double beds, a table and two chairs, a bathroom with a separate vanity and sink area, an in-room safe and high-speed Internet access. • All rooms have two double beds or one king-size bed. • Bus service to other Walt Disney World® Resort locations. • Everything Pop – Shopping and dining for breakfast, lunch, dinner and snacks. • Lounges, pool side snack bars and pizza delivery service.